In greyhound racing, the dogs actually grade themselves. When a greyhound begins its racingcareer, it is classified as a maiden, which means non-winner. If it wins, it advances to grade J. When it wins a grade J, it proceeds to D and so forth until it moves up the ladder to the top grade – grade A. A greyhound will also drop in grade during its career. If it fails to come in first, second or third in three starts, or better than two thirds in four starts, the greyhound falls down in grade. When a greyhound wins and advances in grade, its chances of winning are lowered. Conversely, when a greyhound drops in grade, its chances of winning increase. 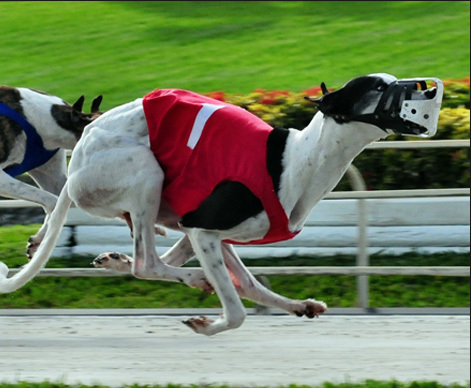 Smart handicappers always consider a greyhound dropping in grade – it’s a good bet. An early speed greyhound is one that is consistently first, second or third at the first turn. In the program, you can tell the greyhound’s first turn position by looking at the chart and finding the column marked “1/8”. Early speed greyhounds will finish in the money approximately 80% of the time. Most problems occur at the first turn when the greyhounds are going at full speed and are usually tightly bunched. So the greyhound that can break out of the box and reach the first turn in front, has a better chance of avoiding first turn problems. So look for early speed- it’s ALWAYS a good bet. Post position is selected at random when the races are being drawn. Some greyhounds prefer to run on the inside of the track, while others run the outside and still others prefer mid-track. When the starting box opens, the greyhound will naturally run to the area of the track that it prefers. Thus, when a greyhound that likes the inside position draws an inside box, such as the 1,2 or 3, it is in what is said to be a “favorable post position.” If that same greyhound drew an outside box – say the 7 or 8 – it is likely that once the box opens, the greyhound would cross the field attempting to reach the inside. Being in an “unfavorable” post position, it runs a high risk of bumping and colliding with other greyhounds.